Join us for an amazing experience keeping one Shabbat together. In conjunction with the Chief Rabbi’s Shabbat UK. 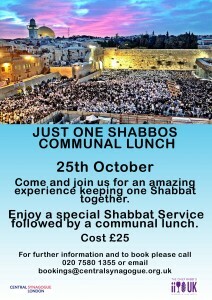 Enjoy a special Shabbat Service followed by a communal lunch.